Realistic Battery Operated 4-inch Plastic Toy Dummy Hand Grenade. Squeeze the handle trigger and ticking timer sound plays for approx 5-8 seconds before explosion sounds. 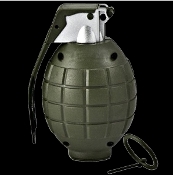 Release pin can be inserted and pulled out to simulate a real grenade. Loads of fun! Pull the pin and *ROLL (*do NOT throw) to watch unsuspecting victims react! Just the right cosplay costume accessory for military soldier, steampunk outfit, theater stage act, comedy gag, pretend or role-play. *WARNING: Should not be thrown on hard surface as it may damage toy! *ROLLING recommended for longest use. Requires 2-1.5V AG13 (LR44) Button Batteries, *INCLUDED. Size: approx. 4-inch (10cm) tall x 2.25-inch (5.63cm) wide. About the right size for an actual small grenade.